Special Deals at the bottom of this page! 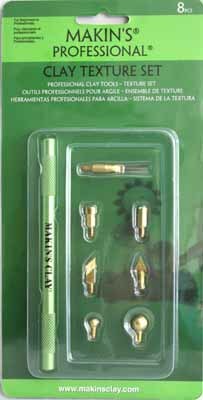 This above sets of professional tools is for Makin's Clay enthusiasts who like to add a special touch to the clay surface created.These multi-functional tools are great for stamping, making, texturing, cutting and branding. 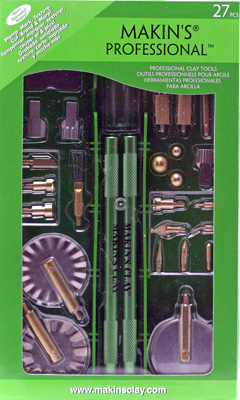 For all types of clay including Metal Clays, Ceramic Clays and Polymer Clays! 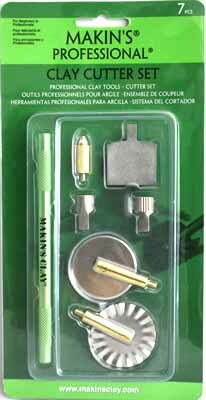 Inside the package you will find more Tips & Techniques! 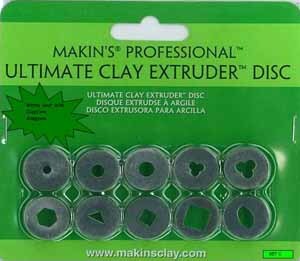 The Ultimate clay gun extruder has many uses. 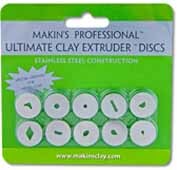 With the 20 disc designs you can create many different embellishments for your projects. The round discs are for vines, stems, borders, and letters. The screen discs are for hair, grass, straw and floral stamens.The flat slot discs are for weaving baskets, lattice, ribbons and bows. 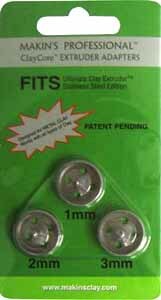 The square, triangle, half round discs are for bricks, logs, borders, and can be cut and used for small beads. 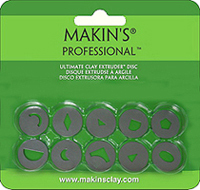 The Makin's Professional® Ultimate Clay Extruder® Deluxe Set combines the next generation of the Makin's® patented screw-type extruder, 15 popular discs designs, 3 sizes of Claycore® adapters and 2 extra O-rings in a convenient and secure storage case. The new extruder incorporates an L-shaped handle that can be adjusted to optimize user's comfort and internal features to accommodate higher torque requirements. The discs included are an assortment of designs frequently used by artists when creating geometric embellishments and complex armatures. The three different sizes (1 mm, 2mm & 3mm) of Claycore® adapters are used in conjunction with discs which enable artists to create custom beads of various shapes and designs. 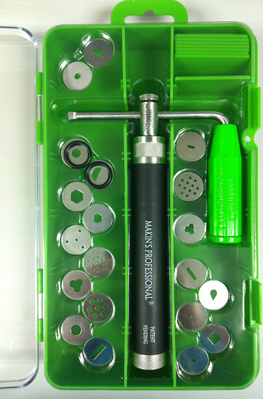 The durable case has an easy-accessible resting place for the extruder, ten separators which keep extruder accessories organized in individual storage compartments, a clear see-through top and a double latch locking mechanism. 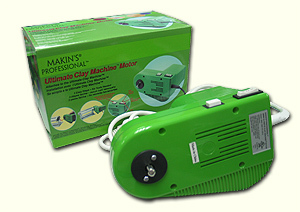 This special version of the popular Makin's Professional® Ultimate Clay Extruder is especially designed with metal clay artists in mind. 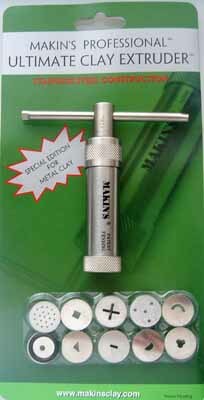 Ten stainless steel discs are included with the extruder and are specifically sized to be appropriate for metal clay, though the extruder can also be used for air-dry and oven bake polymer clay applications. 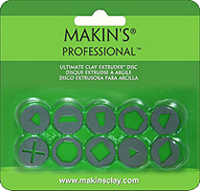 A set of 10 additional discs are available to expand the creative possibilities of this exciting new precision clay tool. 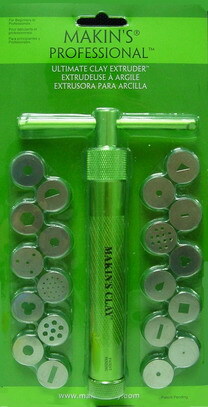 The "Makin's Professional® Ultimate Extruder Set" combines the next generation of the Makin's® patented screw-type extruder, 20 popular disc designs and 2 extra O-rings in a convenient and secure storage case, The new commercial grade stainless steel extruder incorporates an L-shaped handle with ergonomic grip that can be adjusted to optimize user's comfort, control and torque requirements, The discs included are an assortment of designs frequently used by artists when creating geometric embellishments and complex armatures. 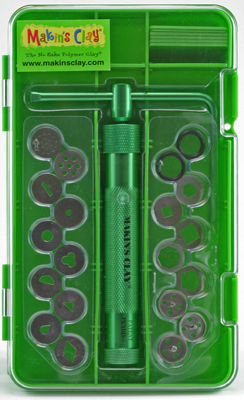 The durable case has an easy-accessible resting place for the extruder, ten separators which keep extruder accessories organized in individual storage compartments, a clear see-through top and a double latch locking mechanism. 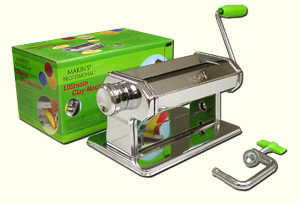 The Makin's® extruder has been accepted in the polymer clay, cake decorating and other industries world-wide as being very durable and designed to meet the diverse applications of professionals working with various types of modeling mediums. 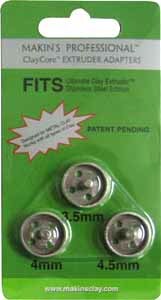 For best results thoroughly condition modeling medium to achieve a malleable consistency.